FORTUNE — The Great Depression. Wall Street in 1987. Japan in 1997. Points of economic collapse are generally crystal clear in the rear-view mirror. Professional politicians in Japan have been telling stories for 20 years as to why they can prevent economic stagnation. In the US, the storytelling started in 2007. All the while, stock market and real-estate prices have repeatedly rallied to lower-highs, then collapsed again, to lower-lows. Despite the many differences between Japan and the US, there is one similarity that continues to matter most in the risk management model my colleagues and I use at Hedgeye, our research firm — debt as a percentage of GDP. Now that the US can’t cut interest rates any lower, the only option left on the table is what the Fed just announced it would start doing — buying Treasury debt. And that could lead the country to the brink of collapse: According to economists Carmen Reinhart & Ken Rogoff, whose views we share, crossing the 90% debt/GDP threshold is the equivalent of crossing the proverbial Rubicon of economic growth. It’s a point from which it’s almost impossible to return. On July 2nd, we cut both our third quarter 2010 and full year 2011 GDP estimates for the US to 1.7%. At the time, the consensus around US economic growth estimates was about 3%. Now we’re starting to see both big brokerage analysts and the Federal Reserve gradually cut their GDP estimates, but not by enough. Even our estimate for 2011 is still too high. With 40.8 million Americans on food stamps (record high) and 45% of the unemployed having been seeking employment for 27 weeks or more (record high), what’s left if (or when) QE2 doesn’t kick start GDP growth? Should we start begging for QE3? Should we cancel the bomb of the National Association of Realtors’ existing home sales report, scheduled for public release on August 24th? Or should we bite the bullet and accept that current economic policy dictates 0% returns-on-savings, even as Washington continues to lever-up our future to the point of economic collapse? 1)The US dollar is battling for resuscitation after 9 consecutive down weeks — down 9% since June. What I have seen mentioned on several occasions now is the 90% debt threshold as the “ok-now-we’re-definitely-screwed”-indicator. I think it’s based on historical research but then it seems a little arbitrary in the big picture because the true public US debt is of course already waaaay past that, more like 385% of it. I agree on most of the market outlook, and in particular I have been following and predicting ongoing strength in Treasurys, alongside consistently falling mortgage rates and interest rates in general. It seems like the author is suggesting some weakness in the dollar when actually the Dollar has just been taking a little break for a few weeks from a fundamental rally. A rally that I expect to resume against other major currencies (including the Yuan, but probably excluding the Yen), when the market begins to tank seriously again. 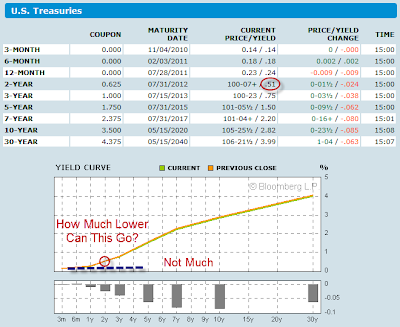 Curve Watchers Anonymous is once again watching the yield curve. Here are a couple of charts. 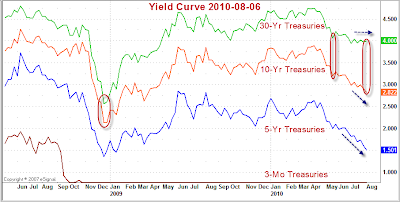 The following chart shows the yield curve over time. The chart depicts weekly closes. 10-year yields did slightly exceed 4% in April but those highs do not show in the above chart. 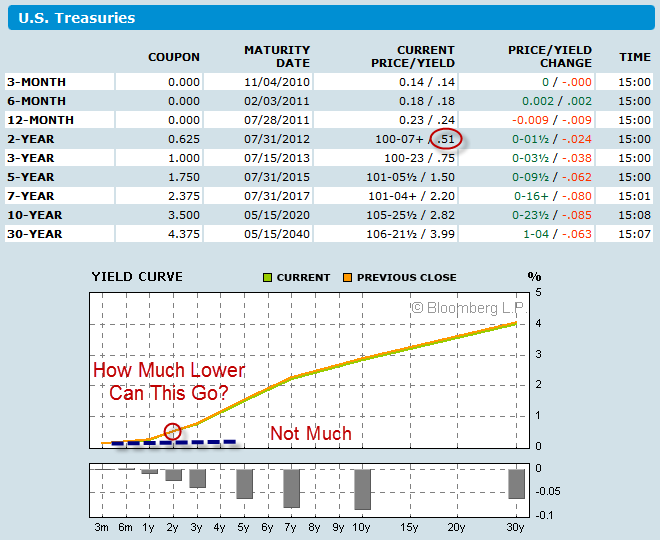 Thus, the decrease in yields is even more dramatic than shown. 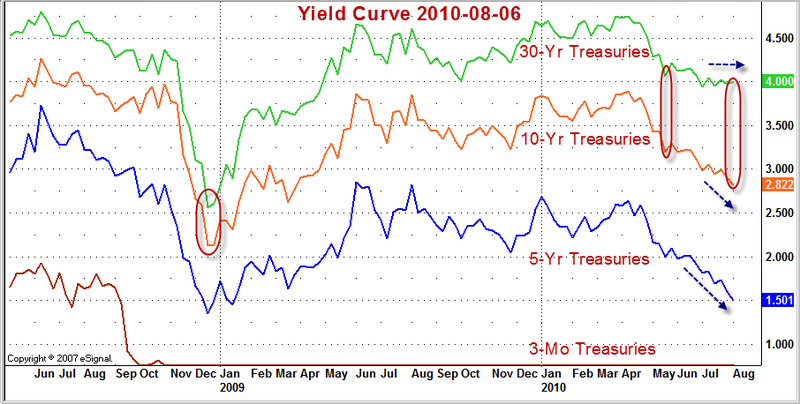 Note the huge rally on 5 and 10 year treasuries as compared to the 30-year long bond. It appears as if someone is putting on a long-10 short-30 spread. If the economic data continues to be poor (and I believe it will be), the low in 10-year yields may not even be in even if the low in the 30-year long bond is in. So much for the idea that an end in the Treasury rally is near … expect the Dollar to catch that wind again soon. Author NimaPosted on August 12, 2010 August 12, 2010 Categories General Economics, InvestingTags economic collapse, markets, mcculloughLeave a comment on McCullough: Is this finally the economic collapse? There’s no hotter debate right now than stimulus vs. austerity, as folks like Paul Krugman and even Barack Obama call for more spending to fix the economy. Michael “MISH” Shedlock is not having any of it, arguing that the financial pump has failed, and that the only way to get the economy back on track is to pursue a policy of less government, and less spending, with a special focus on reforming pensions, public sector unions, and other institutions that drain the government of its resources. As evidence: Japan. The country has now seen multiple decades of recession despite massive pumping on both the fiscal and the monetary side. But at least Japan hasn’t had a debt crisis yet, right? The key word there, says Mish is “YET.” The fiscal situation in Japan is getting more and more tenuous, and it’s no sure thing that the market will retain its confidence in the Japanese government’s ability to finance its debt. And of course the same thing could happen here. But for now in the US the big risk is deflation, which you can see in housing and other economic categories. Spending won’t solve this problem; actual economic adjustment is what’s needed to start growing again. The bulls have pushed aside the bears on Wall Street — for now. Signs of optimism following three consecutive winning days in the stock market have replaced the doom and gloom mood so prevalent in the two prior weeks. Having already heard the bullish case from Doug Kass and James Paulsen earlier this week, Tech Ticker decided to invite Mike “Mish” Shedlock, author of Mish’s Global Economic Trend Analysis, back on the show to hear the other side of the argument. Is he bearish? You bet! “The optimism out there is rather insane,” he says. There’s only a 15-20% chance of the market rallying, Mish tells guest host and Business Insider deputy editor Joseph Weisenthal. “It’s more likely we go down there and test the March lows, and there’s a decent chance actually that we break those lows,” he says. — Slowdown in Europe as austerity measures take hold. Mish is sticking with what’s worked this year: Treasuries and gold. Treasury yields are still near record lows, but he think with the macroeconomy the way it is, it’s very possible, “the bull market in Treasuries is not over.” As for gold, he’d buy on the dips. On Thursday, a slew of retailers posted monthly same-store sales. They were described best as a “mixed bag.” There was no obvious trend in terms of up or down, even within specific categories of retailers. But bulls on the economy should be disappointed. For one thing, notes Mike “MISH” Shedlock author of Mish’s Global Economic Trend Analysis, the same-store sales gainers benefited by the general reduction in store locations. Essentially, survivorship bias is skewing the numbers. If somehow you could take into account all the locations that had been shuttered, you’d see that things were much worse. And there’s evidence for this, notes Mish. State sales tax collections remain depressed, with no indication of a rebound. That, more than the corporate numbers, is the key thing to pay attention to. And with states thirsting for cash, this is a crucial problem that will play out in terms of further budget cuts, and a further drag on the economy. Ultimately it’s all about jobs. Without a jobs recovery, there will be no consumer recovery, and without a consumer recovery, there’s little reason to be excited about the market or the economy. The Dollar has continued to extend its rally as expected. Sales of previously owned homes took their biggest tumble in at least 40 years last month as the impact of a buying spree spurred by a tax credit for first-time buyers waned, according to industry data released Monday. Those who rushed to meet the original November deadline to take advantage of an $8,000 tax credit for first-time home buyers caused a surge in sales earlier in 2009, but left the market wobbly by the end of the year. First-time buyers, who made up more than 50 percent of sales earlier last year, represented just 43 percent of the market in December. The shift also resulted in fewer sales of lower-cost homes, which first-time buyers typically seek. After three months of increases, sales of existing homes, including condos and single-family residences, fell 16.7 percent to a seasonally adjusted annual rate of 5.45 million in December compared with the previous month, according to National Association of Realtors data. That was a bigger drop than analysts had expected and the lowest sales rate since August. It was also the biggest monthly decrease on records that date to 1968, according to the industry group. The December decline “was payback for the tax credit,” said Patrick Newport, an economist for IHS Global Insight. … once the tax credit incentive vanishes home prices will head south again, this is really something that intuitively nearly everyone I talked to knew from the get go, the only question is how much longer Congress wants to keep extending it. It seems like they don’t have a whole lot more to play with. President Obama will call for a three-year freeze in spending on many domestic programs, and for increases no greater than inflation after that, an initiative intended to signal his seriousness about cutting the budget deficit, administration officials said Monday. The officials said the proposal would be a major component both of Mr. Obama’s State of the Union address on Wednesday and of the budget he will send to Congress on Monday for the fiscal year that begins in October. The freeze would cover the agencies and programs for which Congress allocates specific budgets each year, including air traffic control, farm subsidies, education, nutrition and national parks. Even if Mr. Obama and the Senate majority leader, Harry Reid, get the 60 votes necessary to surmount a threatened filibuster against Mr. Bernanke, the Fed appears to have taken a hit to its reputation. … but of course good for the American people, I may add. Not that any of the things I outlined above will change anything as far as the general direction of government growth and power grabbing is concerned. But in the short run it clearly looks like they are hitting a wall right here and now, at least it is hard to find many signs to the contrary. The key thing to keep in mind in all of this: The recent rally, green shoots, and recovery hopes have been created and/or fueled by massive government expenses, and by a believe in the omnipotence of our leaders in Washington. But government spending sprees, too, will have to come to an end sooner or later. On top of that, all that the recent government programs have accomplished is to get marginal individuals back to the same flawed habits, such as owning unaffordable homes, buying too many cars, etc. The interest that the government has to pay on its debts when it runs up sky high deficits, and the taxes it will have to raise in order to make those payments, will be hanging over the recovery like a Damocles Sword. The Federal Reserve, too, will be faced with a similar situation. Let’s assume, for the sake of the argument, that lending activity on homes, cars, etc. were to pick up again. What will the Fed do then? Cut interest rates? Add more bank reserves? Surely not, quite the opposite. Once existing stimulus programs and credit expansion attempts subside, there won’t be much left to pick up the slack. The consumer won’t be able to go back to business as usual unless he goes through a long period of reduced consumption, deleveraging, and savings, a period during which the majority of production and spending inside the US will have to be focused on capital goods, so as to restore a balanced ratio between the production of consumer goods and the production of capital goods. At the point when these government stimuli wind down, Keynesian clowns will be jumping out of the bushes left and right, and demand that the government take on more debt and spend more money. But at some point their mindless tirades will no longer appeal to an overtaxed and overleveraged populace. Their ivory tower nonsense will be way too far detached from simple realities. Any temporary recovery we witness now, is likely to be remembered as just that, a temporary phenomenon. All actions taken so far have set the perfect stage for a double dip recession of enormous proportions, the worst possible prolongation of the necessary correction. If it was our dear government’s objective to repeat the playbook from the Great Depression one by one, then they have indeed succeeded phenomenally.